Download "Huda Musa Amer, MSN, RN Birth date: June 2, 1962. 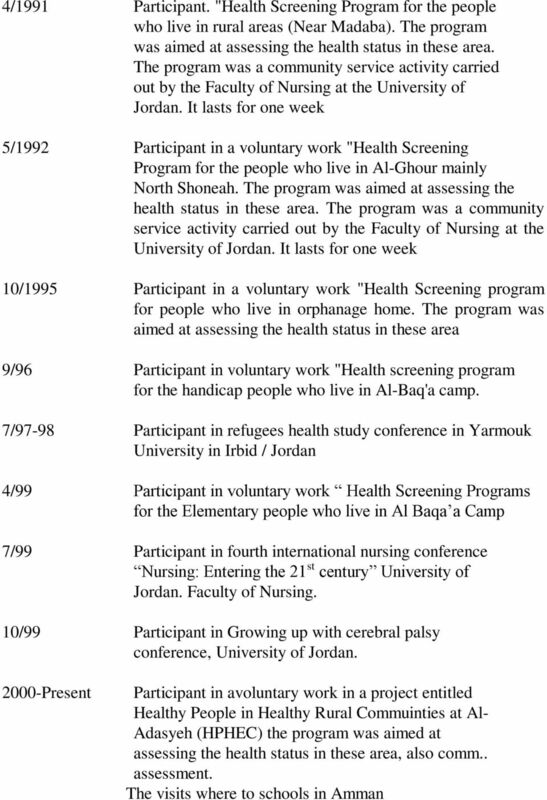 9/81-5/85 University of Jordan Faculty of Nursing B.S.N/Nursing Amman - Jordan"
7 2004: work shop on strategies for AIDS Prevention by USAID & WHO 2005: work shop on Integrity AIDS and management of sexually transmitted diseases in nursing and medical curriculum in all universities. 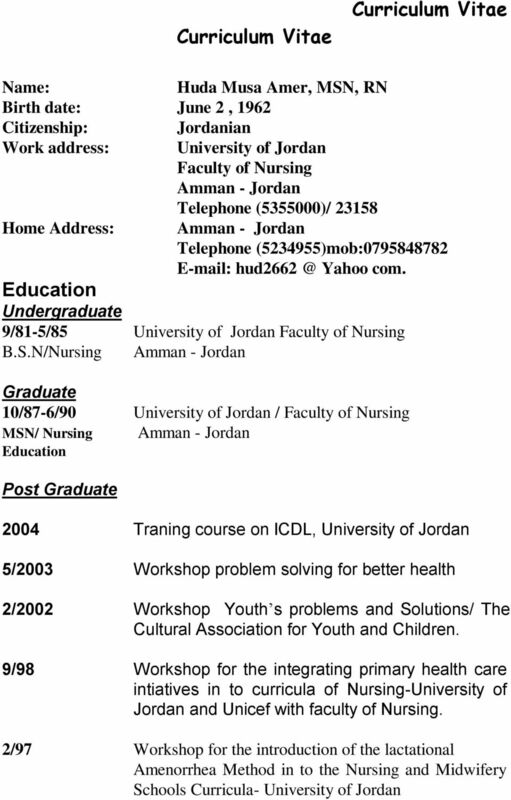 2006: participated in the first International Jordanin Nursing concil. 2009: Participated in Test Deveopment Workshop, Commission on Graduates of Foreign Nursing schools at Jordanian Nursing Council. 2010: Coordinated and planned a workshop titled"training of trainers of "Item tes writing and clinical teaching and evaluation" at Jordan University. 2011: Participated in the Distance Learning course on Partograph offered through the Global Development Learning Network at Jordan University. 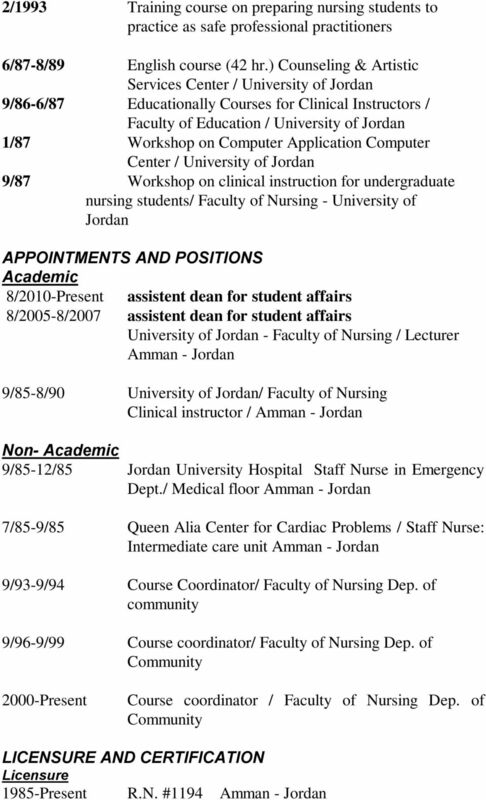 2011: Participated in " International Nursing Fourm: Global Partnerthip in Nursing "at Jordan University. Laith G. Mazahreh, Ph. D.
Andrea Wolf, DNP, FNP-C, ANP-C, PMHCNS-C 1224 Mill Mar Road Lancaster, PA 17601 h- 717-898-3178 c- 717-371-4497 wolfa1224@gmail. Curriculum Vitae. Mary J. Hossley, MSN,GNP, RN Instructor The University of Southern Mississippi Hattiesburg, MS (601) 307-5377 M2hossley@yahoo. INTERNATIONAL ASSOCIATION OF SICKLE CELL NURSES AND PHYSICIAN ASSISTANTS, INC.
LPN to RN Curriculum (Challenge OB, Peds & MH) Categy B Humanities Elective MA 109C General Mathematics NUR 215C, Maternal Newbn Nursing** (2.5 credit hours) credit f the cresponding clinical component. CURRICULUM VITAE. NAME: Penne Perry Mott ADDRESS: 2085 Buttermilk Road, Cordova, AL 35550 PHONE: Cell - (205) 522-8109 Work (205) 387-0511 ext. Leslie M. Mayrand, Ph.D. 2601 W. Ave N /ASU Station #10902 San Angelo, TX 76909 325-942-2630 (voice) or 2631 (FAX) leslie.mayrand@angelo. 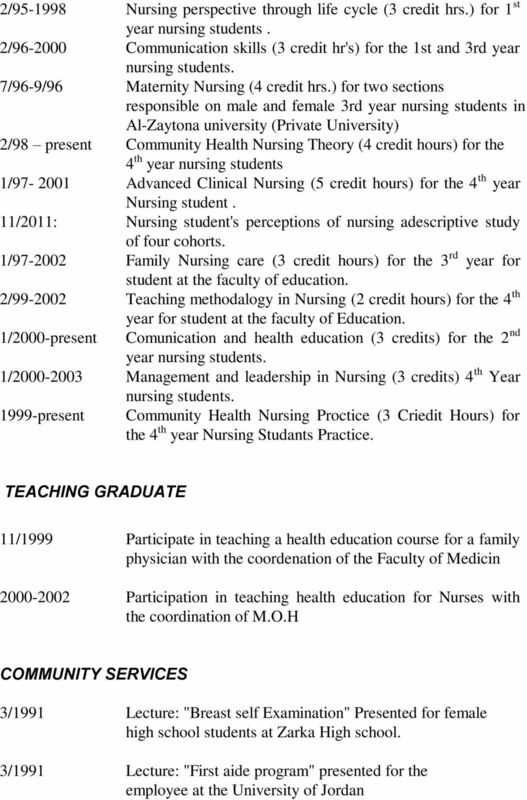 CURRICULUM VITAE for Daniel C. Valdez, M.D. DEBRA A. ELAM, R.N., M.S.N., S.N.